Public Transport Holland Shop is designed for visitors from all around the world who wish they could visit a different country without having to worry about their public transport. At this web shop you will most definitely find the most attractive prices and services. We deliver all around the world, we are quick and take into account that you value your privacy. Traveling products for Amsterdam, Rotterdam, The Hague and more! 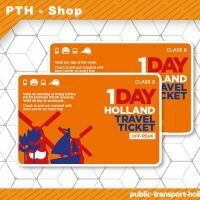 When being in The Netherlands you will immediately notice that the main way of traveling in the bigger cities like Amsterdam, Rotterdam and The Hague is by using public transport and the easiest way to use this is with a Public Transport Chip Card (or OV-chip card). This is a plastic card on which you put credit to pay for the bus, metro or train, no more hassle with all the different paper tickets anymore! In our web shop it’s very easy to buy an OV-chip card for everyone, in this way you can prepare for your transport during your holiday or business trip in Holland when you haven’t even left home yet! Because of the diverse work floor we know very well that it is not easy to get full service and advise on what travelling product you should buy when you do not speak Dutch yourself. If you regularly travel within Holland it is very likely that your transportation could be much cheaper. Therefore we offer to help you choose the best subscription to use for the public transport in Holland when you stay for a longer period. Is it safe to order a Public Transport Chip Card online? The firm behind this web shop is Chip Bizz and we are proud to be able to call ourselves the only independent certified supplier of the OV-chip card. As said before, we value your privacy just as much as you value your own, therefore we use reliable connections and do not use personal information for goals other than delivering your order to you. What to buy for a short stay in the Netherlands? If you are visiting Amsterdam, The Hague, Rotterdam or any other city in The Netherlands for les than four days, we offer 1-day, 2-day and 3-day tickets. With these tickets you are able to travel unlimitedly within a certain city as long as the day-ticket is valid. A ticket like this is helpful when you visit Amsterdam for a weekend, because it enables you to travel from the centre of Amsterdam to Schiphol Airport and back as well! In contrast to a lot of other suppliers we do sell large amounts of traveling products for an attractive price! This way we can offer the best Public Transport product in large numbers for example for all visitors to your meeting in Amsterdam or governmental convention in The Hague. Apart from selling high volumes of OV-cards we will offer your company full support, service and above all, the best personalised advice. Through this way we make certain that we are the most suited partner in business for you. For more information about what we can offer your company, please contact us at info@public-transport-holland.com.